$69 Milwaukee MW401 Smart TDS/ppm Meter, NEW! Testing your Total Dissolved Solids in any water such as an aquarium has never been easier with the new Milwaukee Instruments MW401 TDS Meter. TDS meter – range: 0 –1990 ppm – with Automatic Temperature Compensation and 1 point manual calibration supplied with MA811D/1 TDS probe, a 9 V battery, a 20 ml 1382 ppm sachet buffer solution and screwdriver for calibration. The Milwaukee MW401 is new in box unit portable water tester. Milwaukee MW401 is a conductivity and TDS Portable Meter, with Automatic Temperature Compensation, and are perfect for the educational and agricultural marketplaces. Soil conductivity is checked before fertilizer application to pinpoint field needs and after fertilization to establish its effectiveness. The EC testing agricultural operation with a method to optimize chemical applications and decrease operating cost. These instruments have been designed to meet the Grower's requirements for equipment suitable to the rough environments found in agricultural and hydroponics applications. 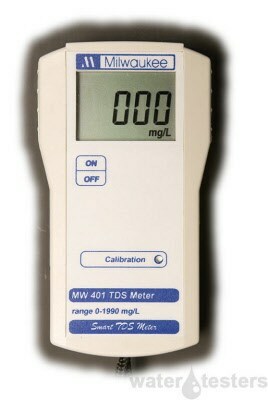 SM100 pH METER, RANGE: 0.0 to 14.0, WITH 2 POINT MANUAL CALIBRATION, ±0.2 pH ACCURACY. SUPPLIED WITH A MA911B/1 DOUBLE JUNCTION pH ELECTRODE, 9 V BATTERY, 20 ml. pH 7.01 SACHET BUFFER SOLUTION AND SCREWDRIVER FOR CALIBRATION. SM101 pH METER , : 0.00 to 14.00, WITH 2 POINT MANUAL CALIBRATION, ±0.02 pH ACCURACY. SUPPLIED WITH A MA911B/1 DOUBLE JUNCTION pH ELECTRODE, 9 V BATTERY, 20 ml.pH 7.01 SACHET BUFFER SOLUTION AND SCREWDRIVER FOR CALIBRATION. SM500 ORP METER – RANGE ± 999 mV, ACCURACY OF ± 5 Mv. SUPPLIED WITH A MA921B/1 PLATINUM ELECTRODE AND 1 X 9V BATTERY. SM600 DISSOLVED OXYGEN METER: RANGE 0.0 – 19.9 ppm O2/l , 0.1 ppm RESOLUTION, 1.5% FULL SCALE ACCURACY. COMPLETE WITH A MA840 POLAROGRAPHIC D.O. PROBE WITH 3 METER CABLE, SPARE MEMBRANES, MA9071 OXYGEN ELECTROLYTE SOLUTION, SCREWDRIVER FOR CALIBRATION AND A 9 V BATTERY. SMS115 pH MONITOR WITH CAL-TEST, RANGE 0.0 TO 14.0 pH, ACCURACY OF ±0.2 pH, MANUAL CALIBRATION IN 2 POINTS, SUPPLIED WITH 12 V DC POWER ADAPTER, MA912B/2 pH ELECTRODE, 20ML SACHET OF M10058B, M10004B, M10007B AND M10016B AND SCREWDRIVER FOR CALIBRATION. SMS120 pH MONITOR, RANGE: 0.0 to 14.0, WITH 2 POINT MANUAL CALIBRATION, AND ACCURACY OF ±0.2 pH. SET POINT RANGE: 5.5 TO 9.5 pH, AND LED VISUAL ALARM ACTIVE WHEN READING IS HIGHER THAN SET POINT. SUPPLIED WITH 12 V DC POWER ADAPTER, MA911B/2 DOUBLE JUNCTION pH ELECTRODE, 20 ml. PH 7.01 BUFFER SOLUTION AND SCREWDRIVER FOR CALIBRATION. SMS122 pH CONTROLLER, RANGE: 0.0 to 14.0, WITH ±0.2 pH ACCURACY AND 2 POINT MANUAL CALIBRATION. SET POINT RANGE 5.5 TO 9.5 pH, AND LED VISUAL ALARM ACTIVE WHEN READING IS HIGHER THAN SET POINT. POWER PLUG SOCKET FOR CO2 DOSING. SUPPLIED WITH 12 V DC POWER ADAPTER, MA911B/2 DOUBLE JUNCTION pH ELECTRODE, 20 ml. pH 7.01 SACHET BUFFER SOLUTION AND SCREWDRIVER FOR CALIBRATION. SMS125 pH/ORP CONTROLLER, RANGE: 0.00 to 14.00 pH / ± 1000 mV WITH ±0.2 pH / ±5 mV ACCURACY. WITH 2 SELECTABLE SETPOINTS FOR pH AND ORP AND 2 POWER PLUG SOCKETS FOR CO2 AND OZONE DOSING. SUPPLIED WITH 12 V DC POWER ADAPTER, MA911B/2 DOUBLE JUNCTION pH ELECTRODE AND MA921B/2 ORP PLATINUM ELECTRODE. SMS510 ORP CONTROLLER, RANGE: ± 1000 mV, WITH ±5 mV ACCURACY. SET POINT RANGE 0 TO 600 mV, AND LED VISUAL ALARM ACTIVE WHEN READING IS LOWER THAN SET POINT. POWER PLUG SOCKET FOR OZONE DOSING. SUPPLIED WITH 12 V DC POWER ADAPTER, MA921B/2 DOUBLE JUNCTION ORP ELECTRODE. MI412 PHOSPHATE LOW RANGE PHOTOMETER, RANGE: 0.00 TO 2.50 mg/L OF PO4, ACCURACY: ± 0.04 mg/L AT 1.00 mg/L. SUPPLIED IN HARD CARRYING CASE INCLUDING 2 CUVETS, REAGENTS, WIPING TISSUE AND INSTRUCTION MANUAL. MI150-US pH/ºC COMBINED BENCH METER WITH AUTOMATIC CALIBRATION IN 1 OR 2 POINTS WITH 7 SELECTABLE BUFFERS, RANGE -2.00 TO 16.00 pH / -20.0 to 120.0 ºC, ACCURACY OF ± 0.01 pH, AUTOMATIC TEMPERATURE COMPENSATION. SUPPLIED WITH A pH REFILLABLE ELECTRODE MA917B/1, TEMPERATURE PROBE MA831R, ELECTRODE HOLDER MA9315, 12VDC ADAPTER AND CALIBRATION SOLUTIONS. MI151-US pH/ORP/ºC COMBINED BENCH METER WITH AUTOMATIC CALIBRATION IN 1 OR 2 POINTS WITH 7 SELECTABLE BUFFERS, RANGE -2.00 TO 16.00 pH / ± 699.9 mV / ±2000 mV/ -20.0 to 120.0 ºC, ACCURACY OF ± 0.01 pH / ±1mV / ±0.4ºC, AUTOMATIC TEMPERATURE COMPENSATION. SUPPLIED WITH A pH REFILLABLE ELECTRODE MA917B/1, TEMPERATURE PROBE MA831R, ELECTRODE HOLDER MA9315, 12 VDC ADAPTER AND CALIBRATION SOLUTIONS. MI 160-US pH/ORP/ISE/ºC COMBINED LOGGING BENCH METER WITH AUTOMATIC CALIBRATION IN 1, 2 OR 3 POINTS WITH 7 SELECTABLE BUFFERS, RANGE -2.00 TO 16.00 pH / ± 699.9 mV / ±2000 mV/ 0.001 TO 19999 ppm / -20.0 to 120.0 ºC, ACCURACY OF ± 0.01 pH / ±1mV / 0.5% F.S / ±0.4ºC, AUTOMATIC TEMPERATURE COMPENSATION, GLP FUNCTION. SUPPLIED WITH A pH REFILLABLE ELECTRODE MA917B/1, TEMPERATURE PROBE MA831R, ELECTRODE HOLDER MA9315, RS232 CONNECTION WITH 2 METER CABLE, Mi5200 SOFTWARE, 12VDC ADAPTER AND CALIBRATION SOLUTIONS. MI 170-US COMBINED LOGGING WITH GLP EC/TDS/NaCl/°C BENCH METER; RANGE: EC 0.00 TO 29.99mS/cm; 30.0 TO 299.0 mS/cm; 3 to 29.99 mS/cm; 30.0 to 200.0 mS/cm; to 500.0 mS/cm WITHOUT CAT; TDS RANGE 0.00 to 14.99 mg/l (ppm); 150 to 1499 mg/l (ppme); 1.50 TO 14.99 g/l (ppt); 15.0 to 100 g/l (ppt); to 400.0 g/l; NaCl RANGE 0 to 400%. °C RANGE: -9.9 to 120.0°C. 1 POINT CALIBRATION FOR EC WITH 6 MEMORIZED VALUES. NaCl WITH 1 POINT. SUPPLIED WITH MA813D/1 PROBE, ELECTRODE HOLDER MA9315, SOFTWARE Mi5200, RS232 CONNECTION WITH 2 METER CABLE, 12VDC ADAPTER AND CALIBRATION SOLUTIONS. MI 180-US COMBINED LOGGING WITH GLP pH/mV/EC/TDS/NaCl/°C; pH RANGE: -2.00 to 16.00 pH and -2.000 to 16.000 pH; ORP RANGE: ± 699,9 TO ±2000 mV; EC RANGE: 0.00 to 29.99 mS/cm; 30.0 to 299.0 mS/cm; 30.0 to 299.0 mS/cm; 3.00 to 29.99 mS/cm, 30.0 to 200.0 mS/cm; till 500.0 mS/cm WITHOUT CAT; TDS RANGE: 0.00 to 14.99 mg/l (ppm); 15.0 TO 149.9 mg/L; 150 TO 1499 g/l (ppt); 1.50 to 14.99 g/l (ppt); 15.0 to 100.0 g/l; till 400.0 g/L . SUPPLIED WITH A pH REFILLABLE ELECTRODE MA917B/1, TEMPERATURE PROBE MA831R AND MA813D/1 CONDUCTIVITY PROBE, ELECTRODE HOLDER MA9315, SOFTWARE Mi5200, RS232 CONNECTION WITH 2 METER CABLE, 12VDC ADAPTER AND CALIBRATION SOLUTIONS. MI 190-US COMBINED LOGGING WITH GLP DO/°C BENCH METER; RANGE: DO: 0.00 TO 45.00 mg/l (ppm) AND 0.0 to 300.o%; °C -5°C to 55.0°C. RESOLUTION: 0.01 ppm to 0.1%, 0.1°C. AUTOMATIC CALIBRATION IN ONE OR TWO POINTS AT 0% (WITH MA9070 SOLUTION) OR 100% (IN AIR) OF O2. AUTOMATIC ALTITUDE COMPENSATION 0 TO 4000 M. AUTOMATIC SALINITY COMPENSATION 0 TO 40 g/l. AUTOMATIC TEMPERATURE COMPENSATION 0.0 TO 50.0°C. SUPPLIED COMPLETE WITH DO PROBE MA840, ELECTROLYTE SOLUTION MA9071S, 2 MEMBRANES, Mi5200 SOFTWARE, RS232 CONNECTION WITH 2 METER CABLE, 12VDC ADAPTER AND CALIBRATION SOLUTION. pH55 pH DUAL LEVEL LCD TESTER WITH AUTOMATIC TEMPERATURE COMPENSATION, 2 POINTS AUTOMATIC CALIBRATION, ± 0.1 pH ACCURACY; RANGE; -2.0 TO 16.0 pH. pH56 pH DUAL LEVEL LCD TESTER WITH AUTOMATIC TEMPERATURE COMPENSATION, 2 POINT AUTOMATIC CALIBRATION, ± 0.01 pH ACCURACY; RANGE: -2.00 to 16.00 pH. pH58 pH/ORP/ºC WATERPROOF TESTER WITH AUTOMATIC CALIBRATION IN 2 POINTS, RANGE -2.00 TO 16.00 pH / -5.0 to 60.0 ºC / ± 1000 mV, ACCURACY OF ± 0.01 pH / 1 mV, AUTOMATIC TEMPERATURE COMPENSATION. SUPPLIED WITH INTERCHANGEABLE pH ELECTRODE Mi58P. Milwaukee Instruments MW401 Smart TDS/ppm Meter, NEW!